A Resource Template is a set of pre-defined Properties, optionally with a Class, to guide Item creation and the interpretation of Properties. Resource templates are managed from the Admin Dashboard, accessed through the left-hand navigation under the tab labeled Resource Templates. On the left side above the table is a display for the number of pages of items, with forward and back arrows. The current page number is an editable field - enter any valid page number and hit return/enter on your keyboard to go to that page. On the right side above the table are two drop-down menus which let you sort resource templates. You can sort by: label, class, owner, or number of items assigned to a template, and have these display in either ascending or descending order. You can use the icons in each template’s row to: edit (pencil), delete (trash can), or view details (ellipses). If you click on the number of items listed for a template, it will take you to a list of all those items. This screencast gives an overview of using and creating Resource Templates. This screencast gives an overview of creating and applying resource templates. All Omeka S installations include a Base Resource template which maps to the metadata fields required by the Digital Public Library of America (DPLA). It will display in the table of resource templates as "Base Resource" with no owner. The Base Resource template contains the following Dublin Core fields: Title; Rights; Type; Creator; Date; Description; Format; Language; Spatial Coverage (Place); Publisher; Alternative Title: Contributor; Extent; Identifier; Relation; Is Replaced By; Replaces; RightsHolder; Subject; Temporal Coverage. 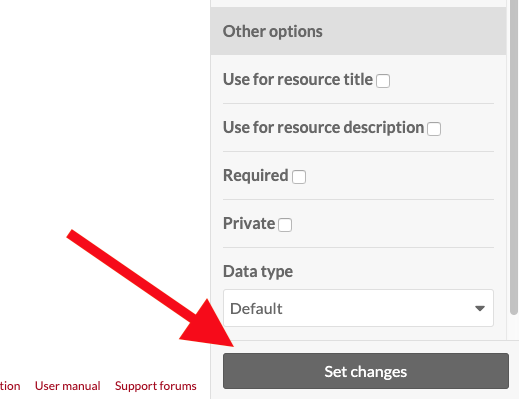 From the Resource Templates tab in the Admin Dashboard, click the Add new resource template button. In the Label property, type the label for your new template. This will be the text displayed in the dropdown for Resource Templates when creating an item, so be sure that the label is clear. If desired, select a class to associate with the template. 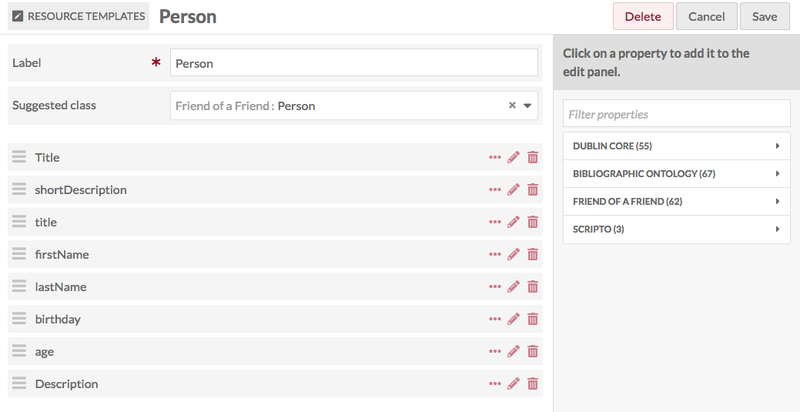 Add properties from the list of vocabularies in the menu on the right side of the screen. You can filter properties in the text box or select from a specific vocabulary using the arrows to the right of the vocabulary names. Be sure to Save your resource template before leaving this page. You can modify the display label, comment on the label, set a property as required, and set the default data type for each property in your template. Change the displayed label of the property that appears when the template is applied to an item by entering the text you want to appear in the Alternate Label field for each property. Add alternate comments for the property in the field Alternate in this section. This will change the text under the property name when users are creating items using your Resource Template. Other options The first checkbox sets whether a property is required when the template is in use. If checked, users will not be able to save an item or item set using this template without adding data for this property. Using the dropdown, you can designate a data type for the property: Literal, URI, or Resource. 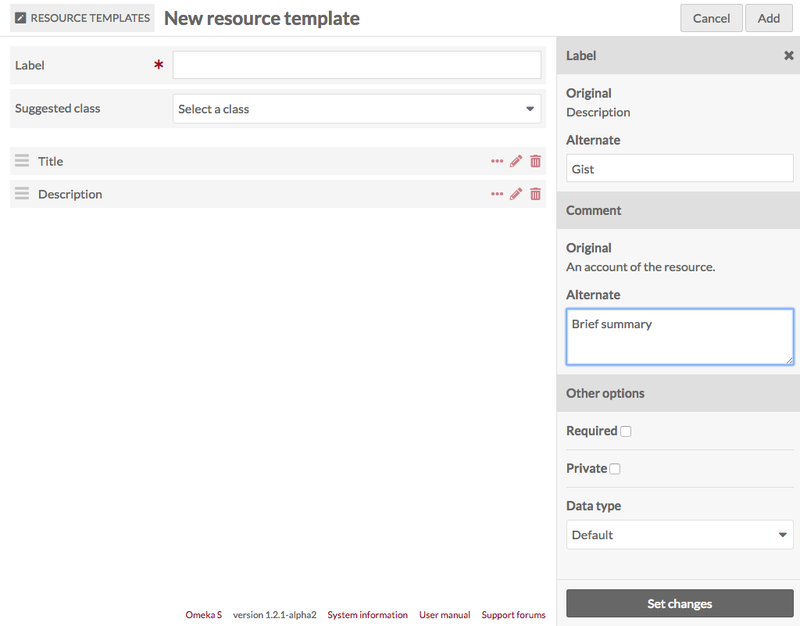 Whichever you choose will be automatically loaded once someone selects that Resource Type and they will only be able to use this data type for the element when using this Resource Template. Resource: either an existing Item or Item Set in the Omeka S install. Note that users who select this resource template when creating an item will still be able to add other properties to the item, and that they will only be required to fill out those which you check as required. Note you must click the Set Changes at the bottom of the drawer for each property that you edit before exiting the drawer or moving on to another property! If you do not click Set Changes, your edits will not be saved. Once you have created a resource template, you can edit it at any time by clicking the edit icon in the table of resource templates, or by clicking Edit in the upper right hand corner when viewing a resource template. If you decide you do not want to edit the template or do not wish to save your changes, simply click the Cancel button located between the Delete and Save buttons in the upper right hand corner of the window. Clicking on the title of a resource template takes you to a table view of all the properties and property options for that template. Whether the property's data is set to private. Click the ellipses next to the original label to open a draw displaying the property's vocabulary, term, and original comment. Use the buttons in the upper right of this page to export or edit the template. It is possible to share a resource template between Omeka S installations by exporting and importing them. Go to the Resource Templates menu on the main navigation. Click the Label of the template you want to export. On the resource template view page, click the Export button in the upper right corner of the screen. Exporting a Resource Template will download it to your computer's default download location as a json file with the same name as the Resource Template's Label. Click the Import button in the upper right corner of the screen. Imported templates which used Value Suggest or Custom Vocab will indicate in the Data Type column what the original source was, and a dropdown to allow you to select a new Data Type (if you do not have the necessary modules, the dropdown will only show the default options). NB: If you want to import a Resource Template using a Custom Vocab, you will need to manually reproduce the Custom Vocab on the second Omeka S installation before importing the resource template.